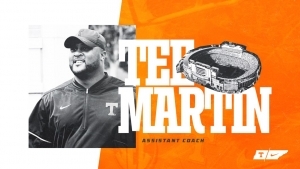 KNOXVILLE, Tenn. – Tennessee football head coach Jeremy Pruitt announced the hiring of former Volunteer quarterback and 1998 national champion Tee Martin as an assistant coach on Saturday. Martin’s specific title and duties will be announced in the coming days. The Tennessee legend returns to Rocky Top following a seven-year stint on the staff at Southern California where he had coached wide receivers since 2012 and added responsibilities as passing game coordinator in 2014 and offensive coordinator at the end of the 2015 season. Martin was named the 247Sports National Recruiter of the Year in 2016 and tabbed a semifinalist for the Broyles Award in 2017. He helped lead the Trojans to a Rose Bowl victory in 2016 and the Pac-12 Championship and a Cotton Bowl berth during the 2017 season. 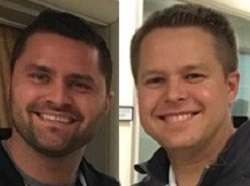 Martin also coached at Kentucky (2010-11) and New Mexico (2009), was a high school coach in Atlanta and a trainer for Nike and the Elite 11 Quarterback Camps following a professional football career that included three years in the NFL with the Pittsburgh Steelers and Oakland Raiders and two years in the Canadian Football League with the Winnipeg Blue Bombers. The Mobile, Ala., native was a two-year starter at quarterback for UT, leading the Vols to a 13-0 season in 1998, culminating with a 23-16 win over Florida State in the Fiesta Bowl to capture the first BCS National Championship. 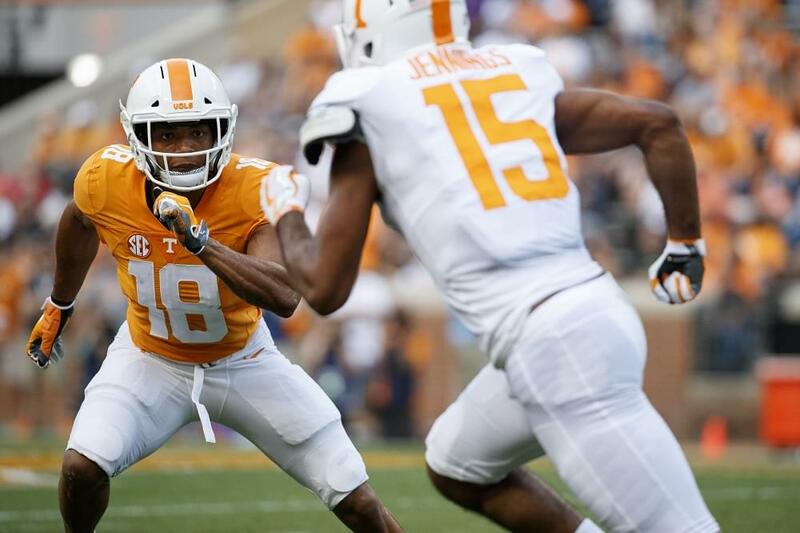 For his Tennessee career, Martin passed for 4,592 yards and 32 touchdowns. He added 614 yards and 16 scores on the ground. He finished with a 22-3 record as the Vols’ starting quarterback – an .880 winning percentage that remains the best in school history. Martin coached 11 NFL Draft selections at USC and Kentucky, including current NFL wide receivers JuJu Smith-Schuster, Nelson Agholor, Marqise Lee, Robert Woods and Randall Cobb – all of whom were chosen in the first two rounds of the draft after having Martin as their position coach. Additionally, Martin coached Sam Darnold, who became USC’s first-ever 4,000-yard passer in 2017 before being selected with the second overall pick in the 2018 NFL Draft by the New York Jets. Darnold and running back Ronald Jones (1,584 rushing yards) teamed with wide receiver Deontay Burnett (86 catches, 1,114 yards) to form the nation’s No. 13 offense (484.1 yards per game) in 2017. USC won the Pac-12 Championship that season, finishing 11-3 and advancing to the Cotton Bowl. Led by Darnold, a freshman All-American, and Smith-Schuster in 2016, USC finished 20th in the nation in total offense (477.1). The Trojans won the Rose Bowl in a 52-49 shootout against Penn State and wrapped up the season with a 10-3 record. Smith-Schuster collected several All-America honors in 2015 after tallying 89 catches for 1,454 yards and emerging as the latest wide receiver to blossom under Martin. He followed Agholor, who caught 104 passes for 1,313 yards and 12 touchdowns en route to snagging All-America honors in 2014. In his first year as the passing game coordinator, Martin orchestrated an aerial attack that finished No. 15 in the nation in passing offense and saw Agholor become a first-round pick, while quarterback Cody Kessler was drafted in the third round. Lee wrapped up his USC career in 2013 as the Trojans’ all-time leader in receiving yards (3,655). In 2012, Lee set the Pac-12 record for receptions (112) and receiving yards (1,721) to go along with 12 touchdowns as he captured the Biletnikoff Award, given to the nation’s top wide receiver, and collected unanimous All-America honors. Martin coached wide receivers at Kentucky in 2010-11, adding passing game coordinator responsibilities in 2011. Cobb emerged as an All-American wide receiver and all-purpose player under Martin in 2010, totaling 84 catches for 1,017 yards and scoring 13 total touchdowns en route to being drafted in the second round of the NFL Draft that spring. Martin, who wore No. 17 at Tennessee, was a two-year starter for the Vols from 1998 to 1999. He set an NCAA record with 23 consecutive completions against South Carolina during the national championship season in 1998. He led the Vols to a 9-3 mark in 1999 and a second consecutive appearance in the Fiesta Bowl. He grabbed All-SEC honors in 1999 before being selected by the Steelers in the fifth round of the 2000 NFL Draft. In 2000, Tee Martin Drive was dedicated to the Orange and White legend. The street runs down the south side of Neyland Stadium and connects to Phillip Fulmer Way. He and his wife, Toya, have two sons, Kaden and Cannon, and twins, daughter A’Yadra and son Amari, who is a starting wide receiver at Clemson. His wife is a recording artist with hit singles, “I Do!” (2001) and “No Matta What (Party All Night)” (2002).